October 20th is a packed day for us at Mergeculture, there is a bike tour we are hosting in the morning and in the afternoon from 12-6pm is the second annual gallery and studio tour hosted by Tempus Projects, one of the longest running galleries in the Tampa Bay Area. Our gallery and studio are a stop on the tour. 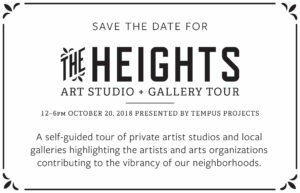 During this self guided tour, visitors will stop at multiple galleries and studios in the Heights (Seminole Heights and Tampa Heights, mainly). A full map, ticket link and details soon to come.